You get hungry! One thing our Cattlewomen do is use what they promote and raise. 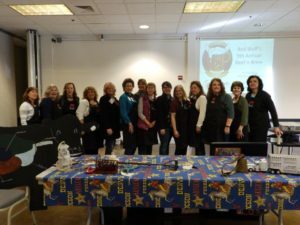 When Jill Scolfield from the California Beef Council challenged the ladies to step into her mystery pantry and come up with a meal – with sides no less- in 20 minutes or less, and the only cooking tool being George Foreman grills, the variety and flavor were over the top! From Salads to elegant Rib Eye plated dinners, Citrus marinated and dry rubbed, topped with mushrooms or grilled onions, these ladies provided proof that dinner can be fast and incredibly tasty when you start with beef as the star of the show. Thank you all for great ideas and proving yet again that Beef is What’s for Dinner! « Spring Meeting 2018 created a Herd!